To accelerate the response to MDR-TB, drug companies must contribute by ensuring local registration, wide availability and affordability of medicines, especially the life-saving drugs bedaquiline and delamanid. 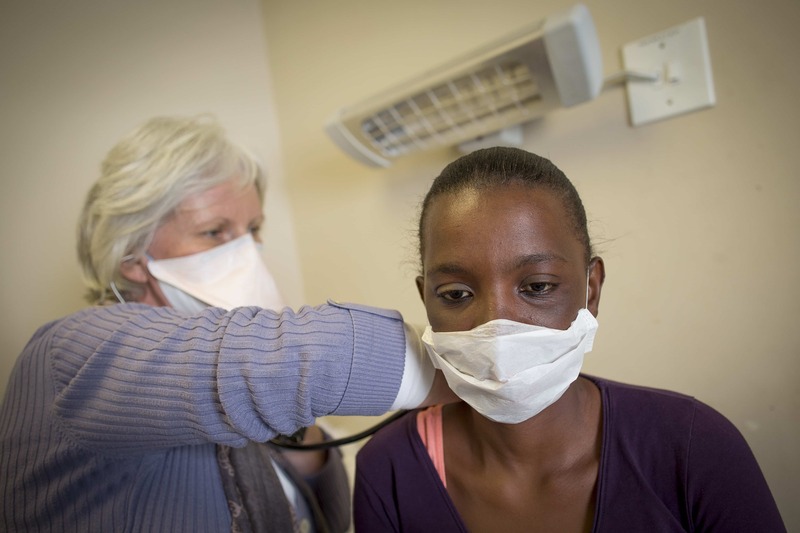 Sibongile Xesha receiving treatment for drug-resistant TB at an MSF treatment centre in Khayelitsa, Cape Town. People suffering from drug-resistant tuberculosis (DR-TB) continue to be deprived of today’s best-possible treatment in part because of high drug prices, according to a new report — DR-TB Drugs Under the Microscope — released by Doctors Without Borders (MSF) at the 49th Union World Conference on Lung Health in The Hague. MSF is now calling on pharmaceutical companies to drop prices to save more lives. MSF’s research shows that DR-TB treatment regimens containing the two newer drugs, bedaquiline and delamanid, represent a significant price increase over older treatment regimens that are no longer recommended. People with DR-TB must receive individually tailored treatment consisting of at least five drugs for different durations, according to the type of drug-resistant TB that affects them. MSF calls, in particular, on US pharmaceutical corporation Johnson & Johnson (J&J) to cut the price of the newer TB drug bedaquiline in half, so more lives can be saved. J&J recently announced a price reduction for bedaquiline for some countries, but this falls short of making the drug affordable in countries hardest hit by the DR-TB epidemic. Its price of US$400 (R5 699, 06) for six months of treatment is still too high, as many people need the drug for significantly longer than six months, driving the price even higher. South Africa made history in June as it became the first country in the world to take a bold step of replacing an injectable drug with toxic side effects, with bedaquiline (an oral medicine) in the standard multidrug-resistant tuberculosis (MDR-TB) treatment regimens for adolescents and adults. In August 2018, the World Health Organization (WHO) recommended expanding use of bedaquiline by making it a core drug for treatment of DR-TB, while at the same time relegating daily injectable and toxic drugs to last-resort options only. This change dramatically increases the number of people who should receive bedaquiline, and requires national TB treatment programmes to scale it up as part of the DR-TB treatment they provide. Despite the expected benefits, high prices remain a significant barrier. South Africa has long been a world leader in setting policies to secure access to bedaquiline, supporting a successful clinical access programme in the same year that bedaquiline received US Food and Drug Administration approval (2012); approving local registration in 2014; and in 2015 introducing bedaquiline into the South African National TB Programme in line with WHO guidelines. MSF’s analysis highlights some positive developments in the DR-TB treatment landscape: prices of some medicines have come down; more paediatric formulations to treat children with DR-TB are now available; and a healthier market dynamic for TB medicines has evolved with the increase in the number of quality-assured suppliers. While positive, these developments should be viewed in the context of the persistent and yawning testing and treatment gap for people with MDR-TB: in 2017 only 29% of people estimated with MDR-TB were diagnosed and just 25% of the estimated MDR-TB cases were treated. The fragile gains in price reductions and additional quality assured suppliers seen over the past 10 years are at risk. The necessary and welcome switch to mostly injectable free treatment regimens using bedaquiline, linezolid and fluoroquinolones as core drugs will certainly increase the price of treatment regimens unless a concerted effort is made to prioritise the affordability of these effective drugs. In addition, as countries lose financial support from the Global Fund to Fight AIDS, Tuberculosis and Malaria, and/or switch to national procurement systems, a re-fragmentation of the market for DR-TB medicines and slower introduction of newer regimens and drugs could result. To accelerate the TB response, thereby ensuring as many people as possible gain access to optimal treatment, governments must take rapid action to implement the new WHO DR-TB treatment recommendations; drug companies must contribute their part by ensuring local registration, wide availability, and affordability of medicines, with a target price of no more than US$500 per person for a full DR-TB regimen; and the Global Fund and other donors must offer financial and technical support to countries in upgrading national protocols and rolling out improved treatment regimens.